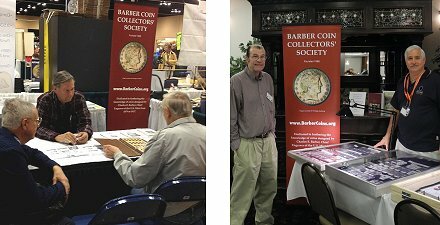 Welcome to the new website of the Barber Coin Collectors' Society (BCCS). 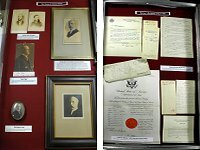 The BCCS is a group of several hundred collectors and dealers dedicated to the study of the American coinage of Charles E. Barber, Chief Engraver of the U.S. Mint from 1880 to 1917. Social interactions at a host of regional meeting venues throughout the United States are a key element of the "BCCS Experience." See why any collector of Barber coinage should be a member of the BCCS. BCCS publishes new images of Charles and William Barber! 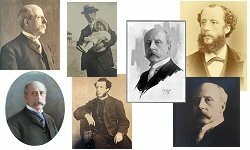 With the generosity of two of Charles Barber's great-grandsons, the BCCS is proud to publish seven never-before-seen images of Charles Barber, including six new photos and one remarkable painting. These are available immediately for download (click image left) and use for publication. One new painting and the only known photo of William Barber (Charles' father and 5th Chief Engraver of the U.S. Mint) is also available here. Soon, the BCCS will also be publishing high-resolution images of astounding artifacts from both Charles and William Barber. ANA Exhibit case photos available High-resolution photos of all 12 cases of the big exhibit from the Philadelpha ANA are available in one PDF file. You can zoom in and read everything that was in the exhibit. To see them, click the image to the left or go to read the document (7.5 mb).